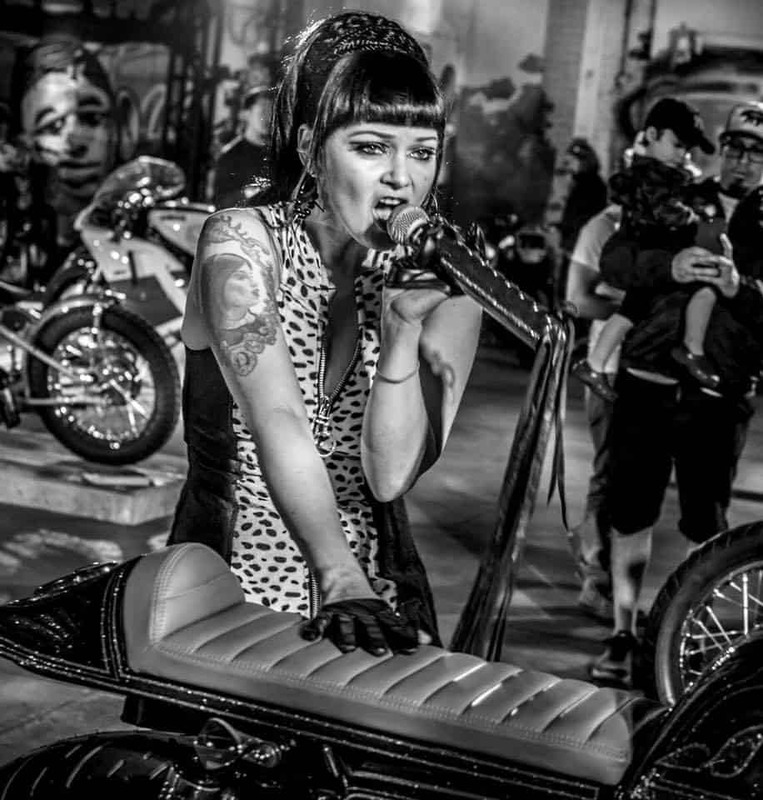 At last, LA has their very own Custom Motorcycle show, situated in Down Town Los Angeles in the Art district, this show not only offers a unique peek into the 2 wheeled lives, but also the Architectural wonder that has remained in this part of the city for many years. 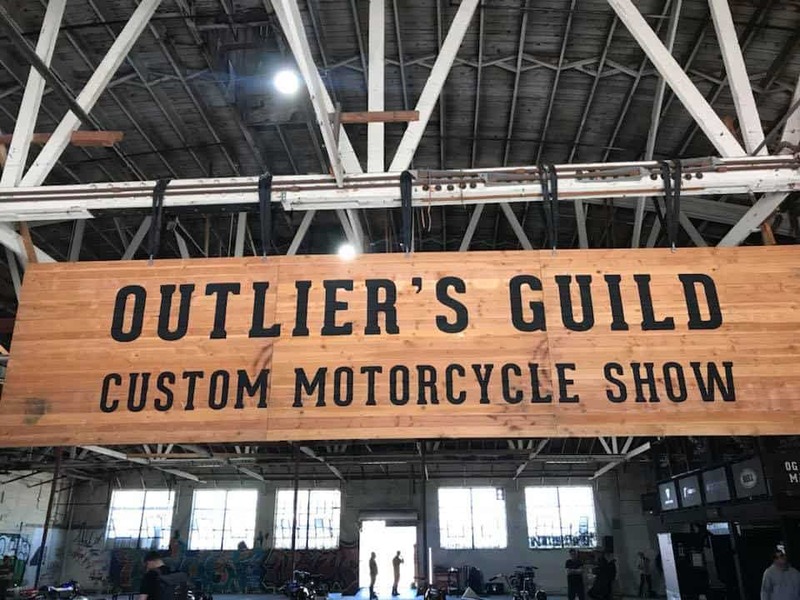 The Outlier’s Guild Motorcycle Show, also referred to as The OG Moto Show, has brought a unique motorcycle experience to Southern California. 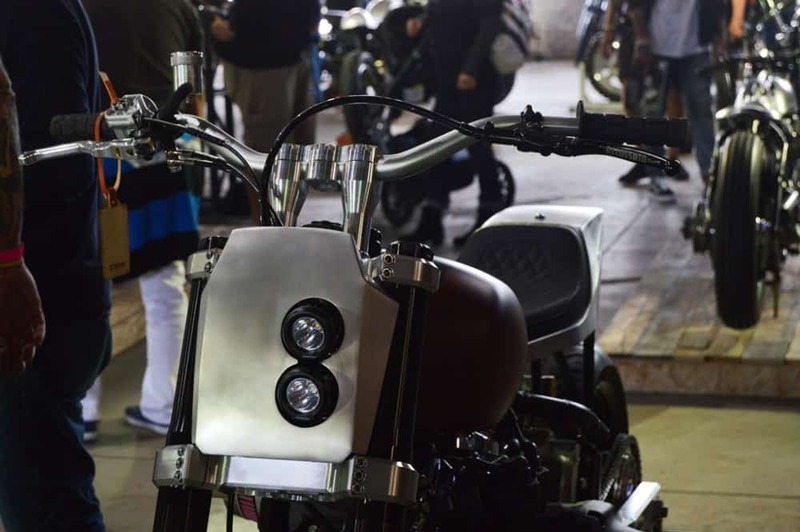 The event will gather over a hundred of the top custom builders from across the country and thousands of motorcycle enthusiasts together in a unique setting. 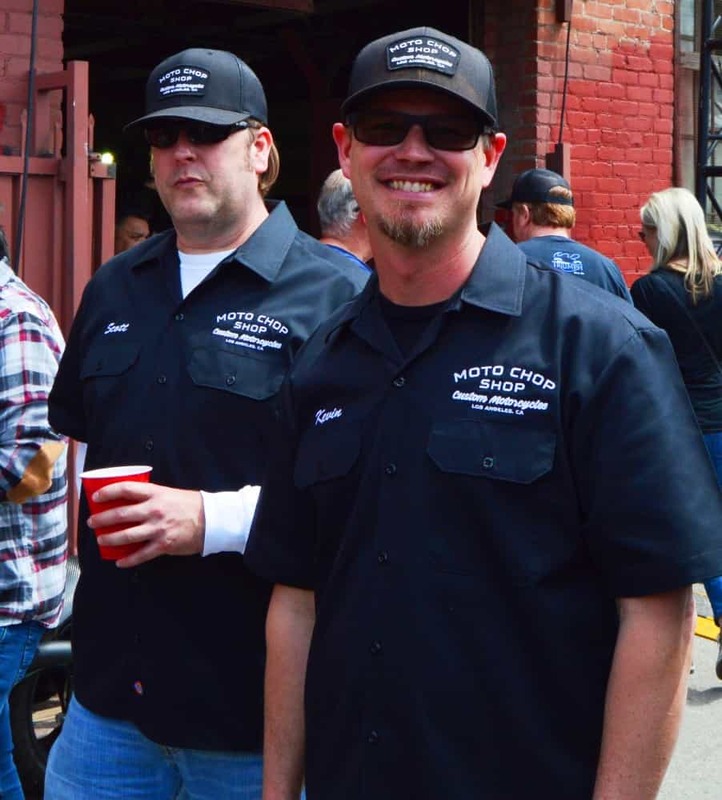 An all-star roster of builders will be participating including: Alchemy Motorcycles, Carpy, Cerberus Motorcycles, Chabott Engineering, Chopper Design, Duane Ballard, Eastern Fabrication, Iron Cobra, Jeff Wolf, JSK Moto, Kickstart Garage, Kiyo’s Garage, Max Hazan Motorwork, Monnom Customs, Moto Chop Shop, Sean Burley, Sosa Metalworks, Speed Merchant, Steady Garage, Steve Cabellero, Suicide Machine Co., Twin Line, Woolie of Deus ex Machina, Zach Siglow and Zanutto Engineering. 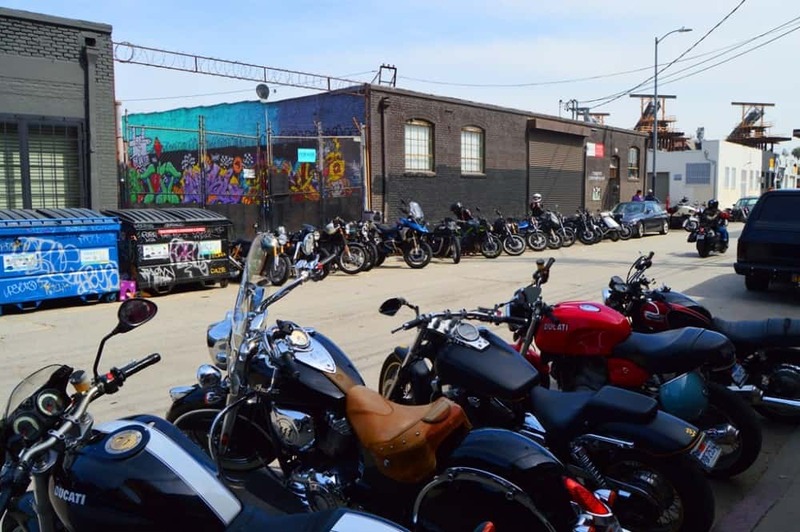 Additionally, the event will feature a one-of-a-kind OG Moto Market with vendors, food trucks, coffee, and live entertainment. 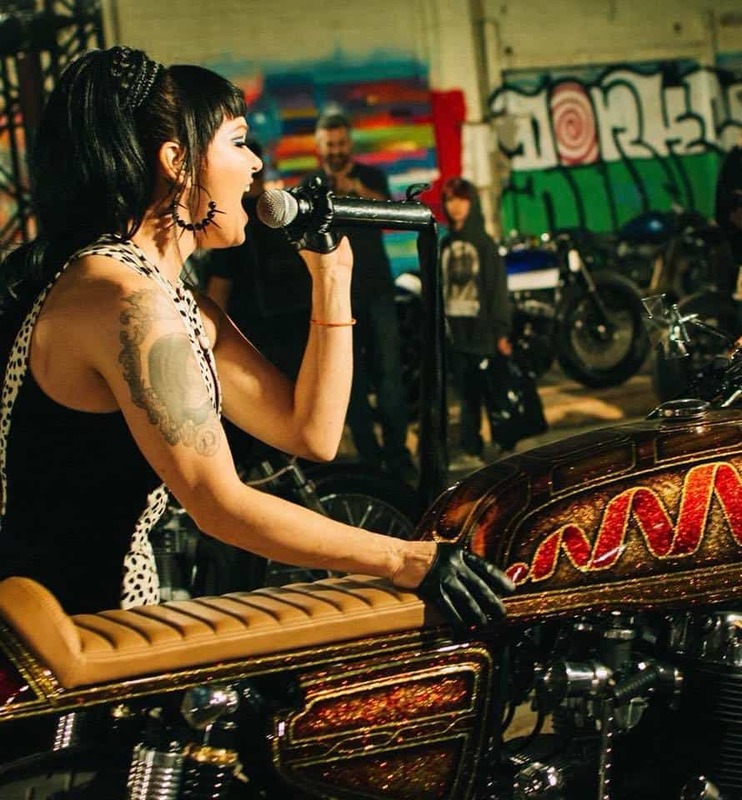 Performing during the event weekend include the Woolly Bandits, an LA-based punk garage band lead by Christa Collins and the Powerflex 5 featuring skateboarding legend Steve Alba on guitar, tattoo artist Corey Miller on drums, and Bobby Abarca on bass. 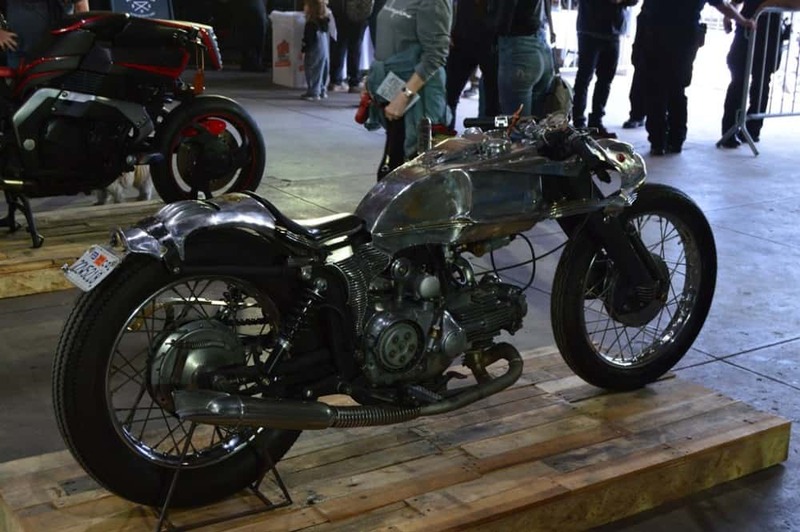 New to this year’s show will be the OG Moto Gallery, an exhibit of motorcycle-inspired art, photography, and a collection of vintage motorcycles. 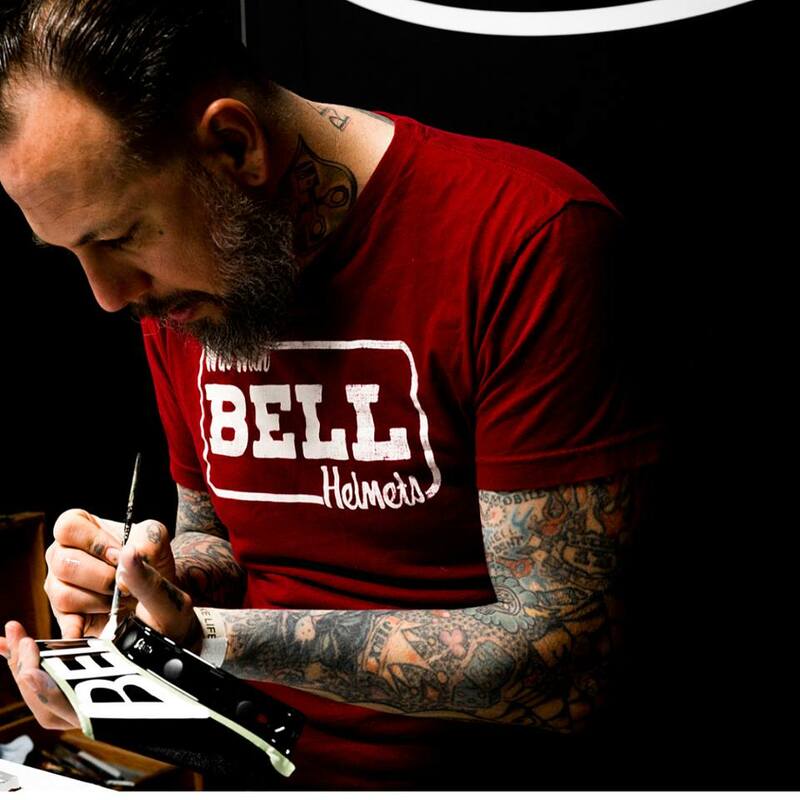 The gallery will feature work from artists and photographers from around the world including an exhibit by the renown artist, Ornamental Conifer, titled “Reliable Souls,” presented by Vans. Other featured artists include: Steve Cabellero, OVMD, Tomas Pajdlhauser, Robert Schlueter, Ben Giese, Maryia Bulka, Jasper Wong, Blue, Carter Asmann, Tyler Cornelius, Andrew Ritter, Bombshell Deluxe, and more. Participating photographers include: Norman Reedus, Estevan Oriol, Willie T, Dylan Gordon, Matt Jones, and Laurent Nivalle. 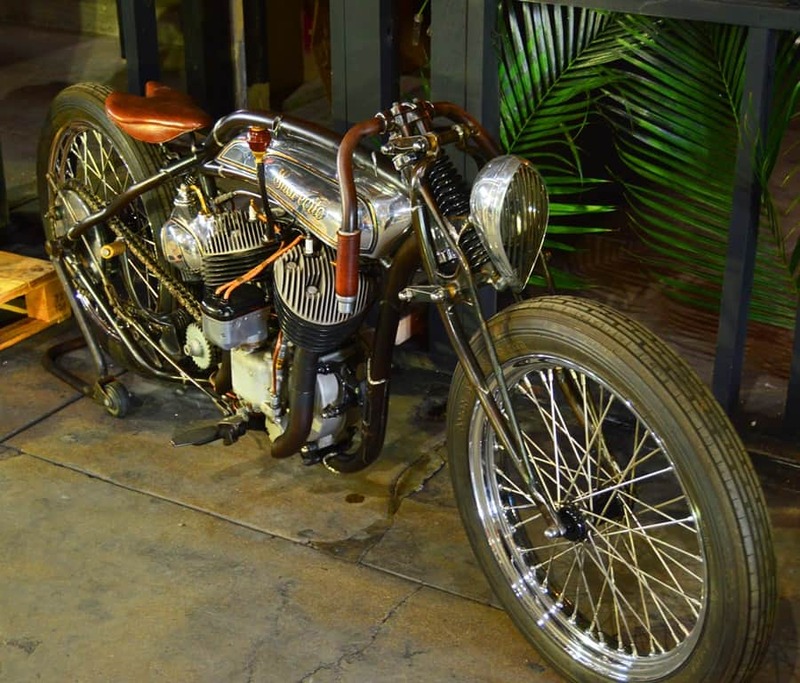 Additionally, the Motodoffo Collection presented by Doffo Winery, an impressive array of twenty classic and vintage motorcycles will be on display within the art gallery. 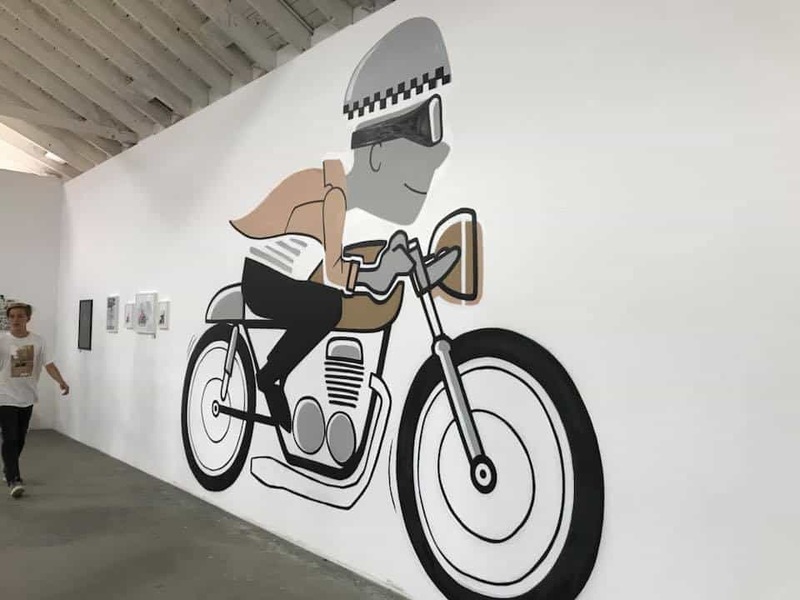 The OG Moto art gallery will be open on select dates after the event with the schedule to be announced on the OG Moto website. 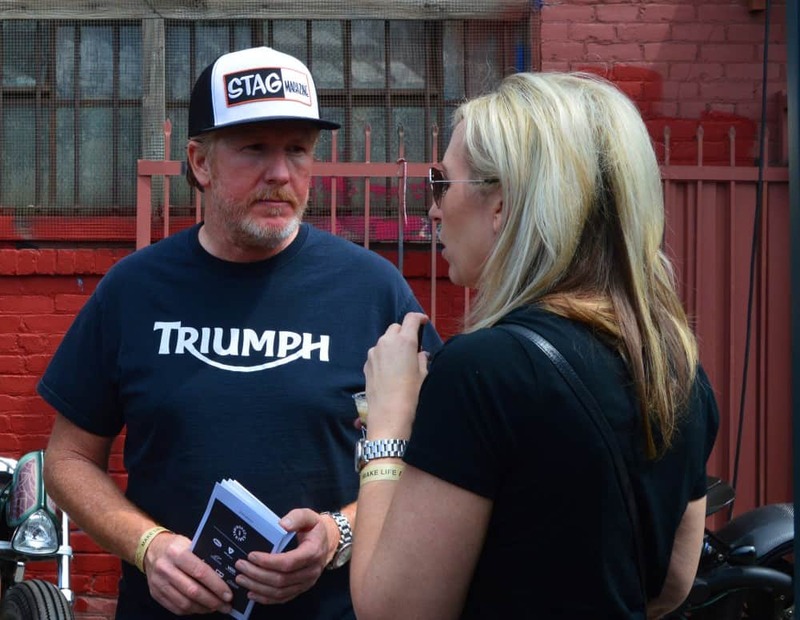 The OG Moto Show is supported by: The House of Machine, Alpinestars, Bell, Flexfit, Meguiar’s, Moto Doffo, Rev’it, Rizoma, Roland Sands Design, Royal Enfield, Vans, and WD-40. 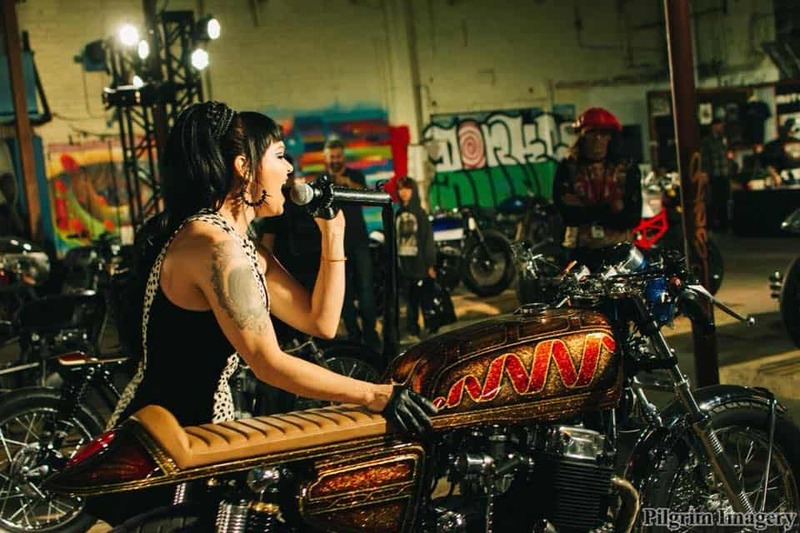 The Outlier’s Guild Motorcycle Show is a motorcycle event that celebrates vintage, modern classic, and full custom motorcycles. 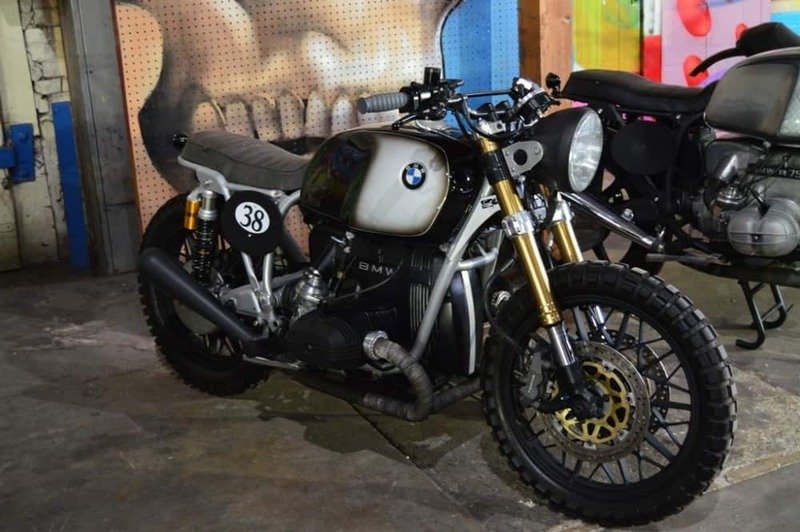 Founded by Jay LaRossa of Lossa Engineering, Stan Chen, John Pangilinan, and Ralph Holguin of RMD Garage with the goal to produce a unique motorcycle experience for enthusiasts. 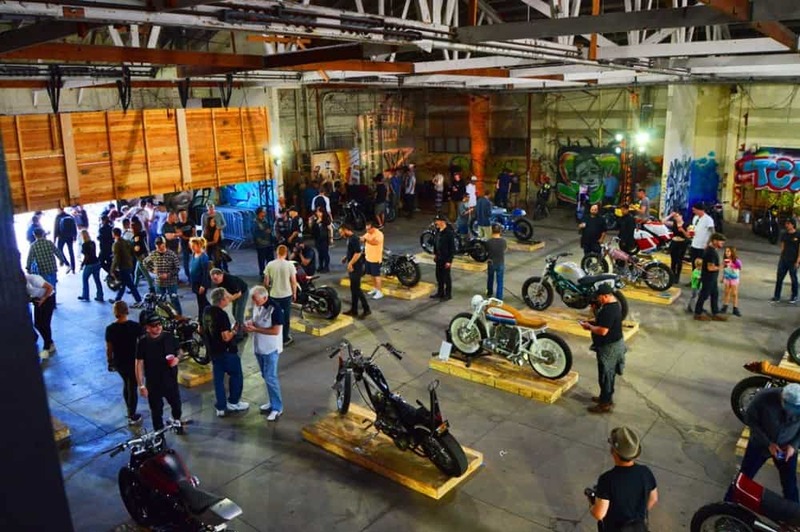 The event will feature art, photography, music and a diverse and impressive collection of motorcycles on display. 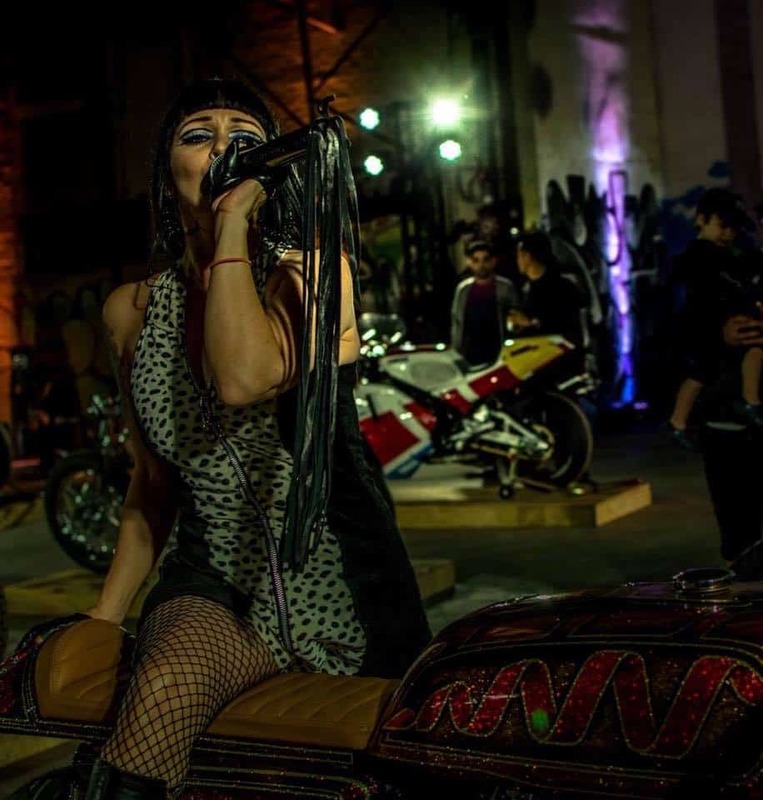 When I pulled into Anderson street just off the freeway in Down Town LA, I knew this would be a very cool venue to have this event, the old buildings had more character than the back streets of Jack the Rippers area in London, I loved the old mixed with a little bit of new. 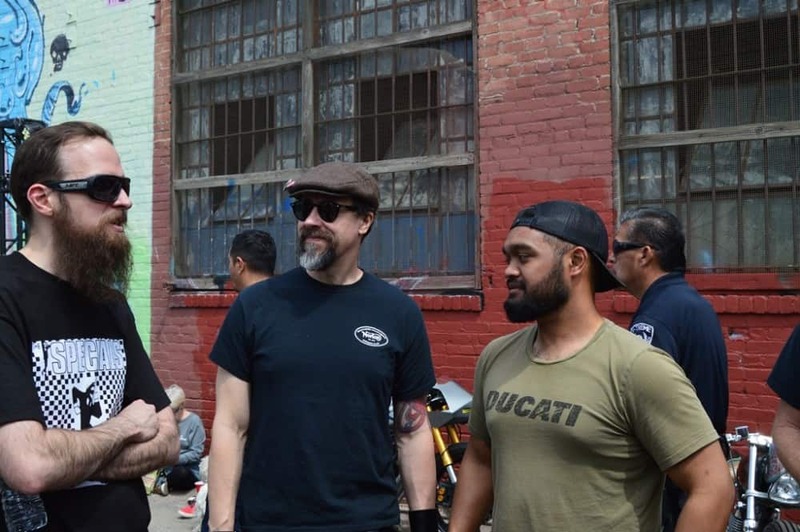 Graffiti seems to be the norm here instead of street signs but- is part of the Down – Town culture, that has molded this part of California, as an artistic explosion of self expressionism. The old Deco buildings that line this area is only muffled by the odd sounds of construction and sometimes the mild mechanical click of a 35mm Camera, as this area is a Photographers Paradise for fashion and craft. I pull into the side street and into the back of the show buildings, emblazed on them are huge renderings of cool art, some people and some just out of this world art that will make you stop and raise an eyebrow or two, a brilliant venue for such a show and I was super stoked to be one of the lucky guys to be invited as a builder. 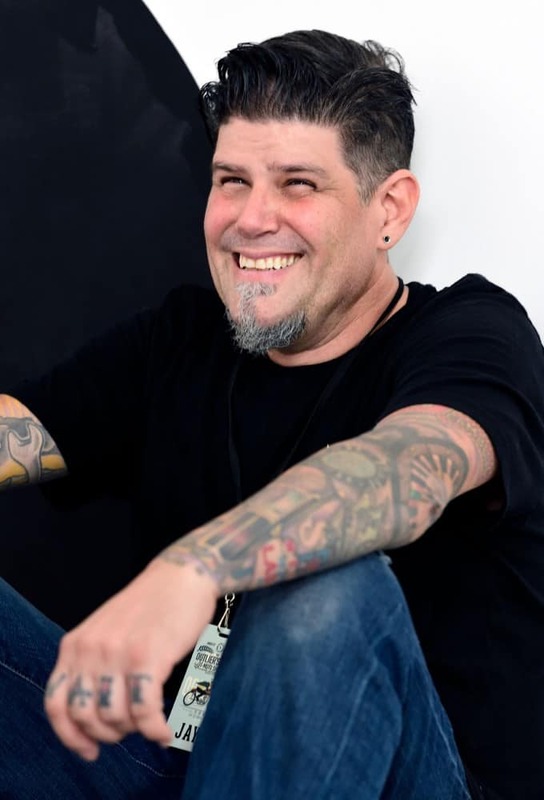 Jay LaRossa has been a builder and Creator for many years, he was one of the first guys that actually came up to me and said hello some 18 years ago at a show in Costa Mesa. 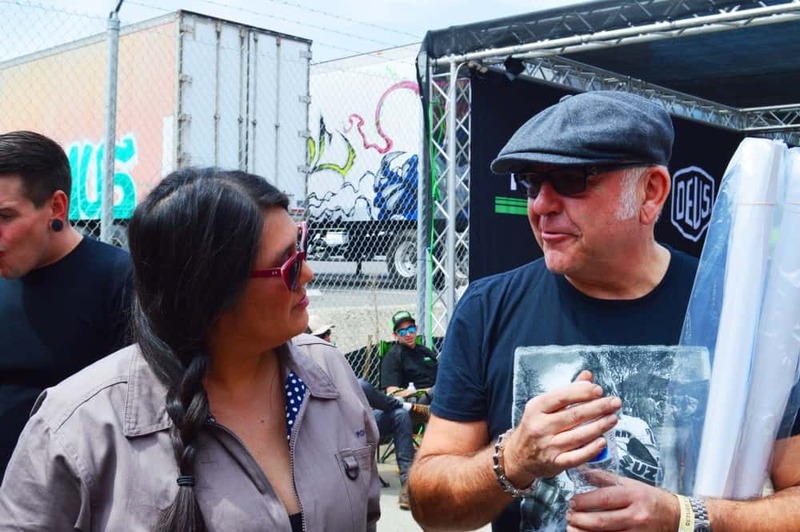 A solid guy much respected in our two wheeled industry and creates some wicked machines, and to be invited here is really quite an honor to be honest. With over 100 machines of builders Motorcycles and so much cool Art that is displayed in the next room, this is a must attend show, the vendors were so friendly and actually spent time showing you what their passion is, the bands Rocked on and there was a totally euphoric feeling in this building, as if everybody was one, I mean- there is no racial undertones in our industry, we are all cut from the same cloth and have a similar interest in many things, if only the rest of the world would be on an even keel like us eh? 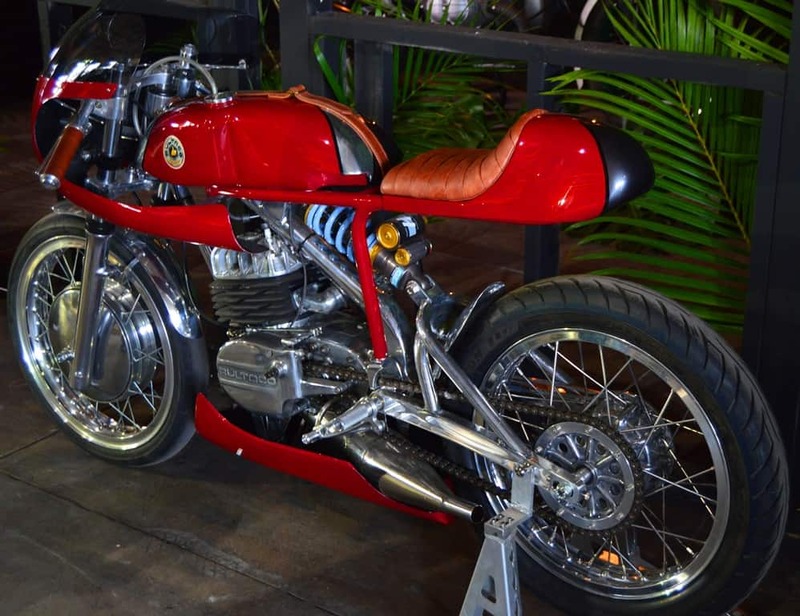 The quality of the motorcycles here were so cool, some fascinating concepts, some bloody mind boggling engineering and the artistic talents were let loose on some of these motorbikes of which I had to pick my Jaw up from the concrete. 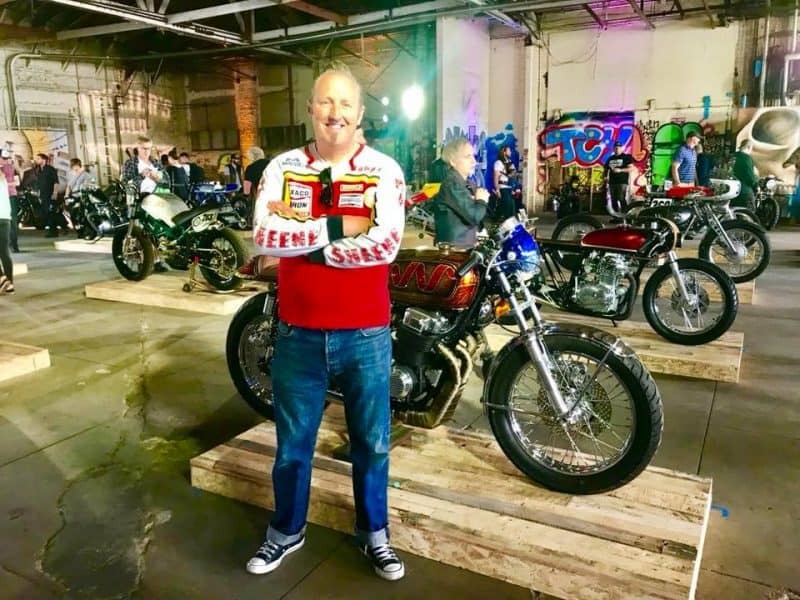 So, to add my bike here and on a platform was indeed a very cool feeling, I was so surprised at how many people knew who I was and I had many questions about my parts and the bike I created- The Harlequin Honda. 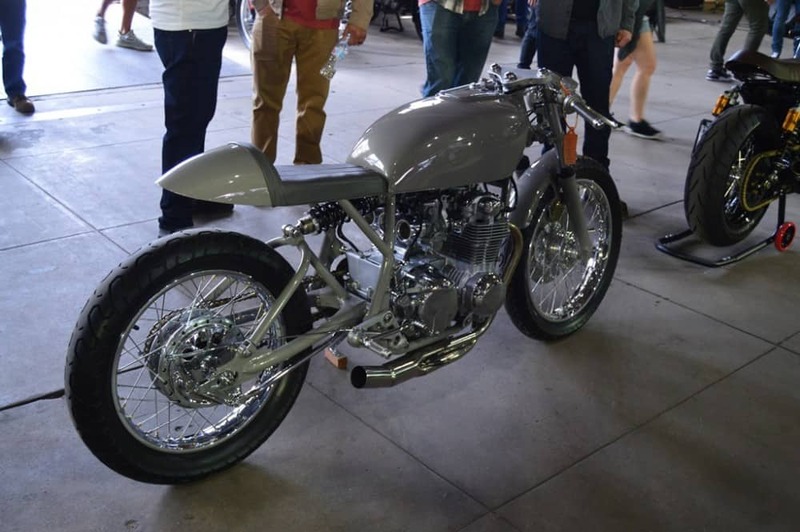 It was like a Family reunion for me in a way and this show had so much to offer for people, I mean, there was something for everyone, be it Custom, Cafe Racer. 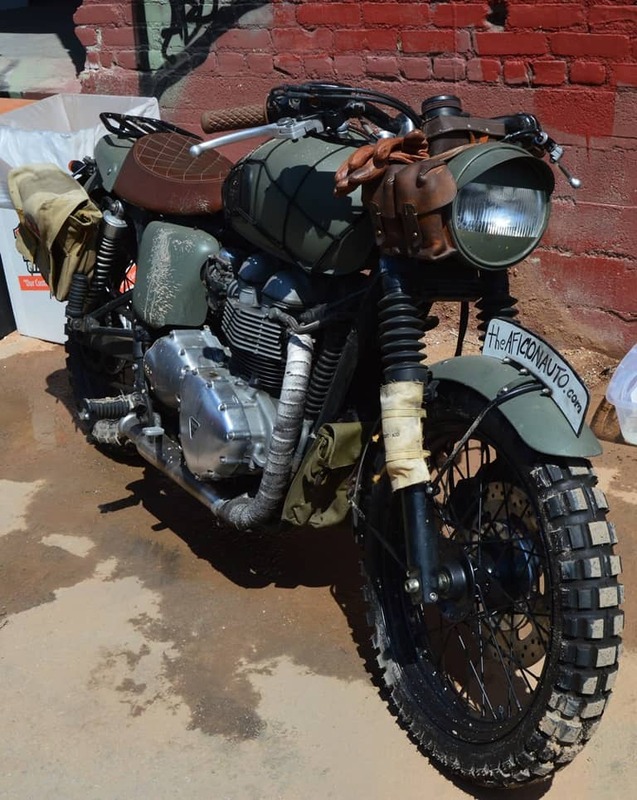 Brat, Tracker. 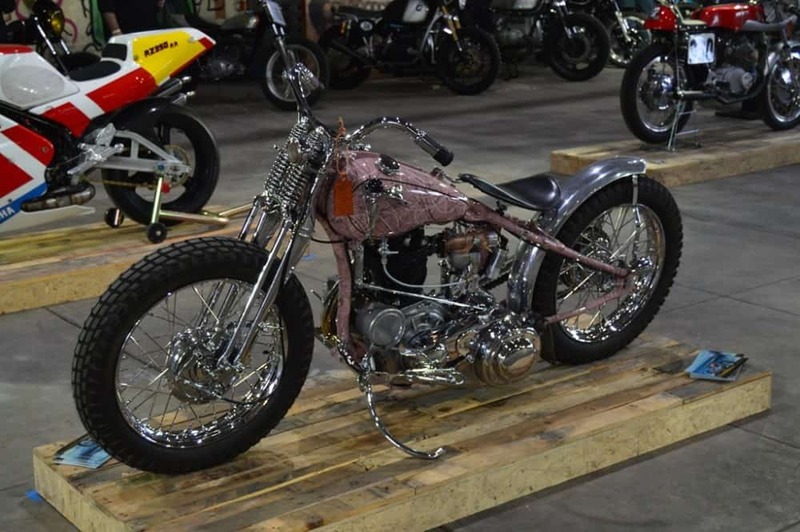 Chopper, Bobber, Classic etc, there was a cool vibe the entire time that Jennifer and I was there and I am not sure how many times we walked around this arena, there was always something that caught your eye. 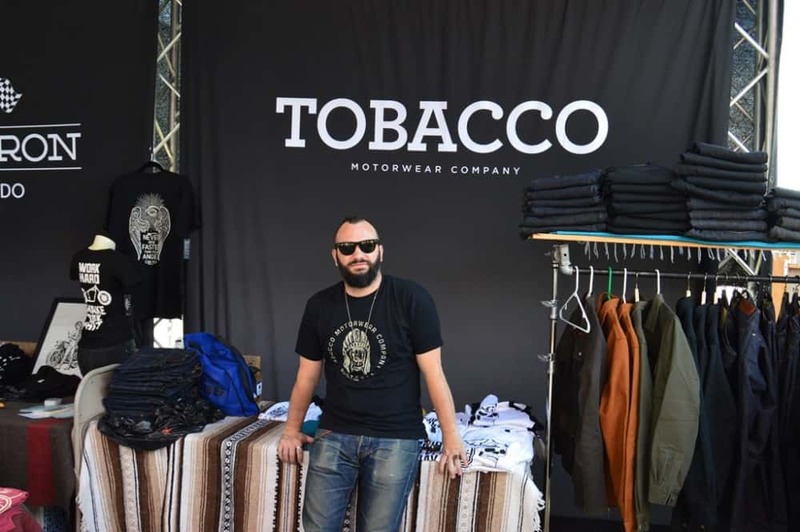 The vendors were a blast and everyone was approachable, also what I liked is, nobody tried to force a product on you, they were there to enjoy the event too and the relaxed atmosphere made this event such a hit, we loved it all. I even scored some cool Moto wear too, there was so much cool stuff that I was glad in a way that I didn’t have my Credit Card with me, else I would be in trouble in the first 5 minutes of the vendor area,Tobacco Motor-wear Company has real quality wear and the shirts are a much better cut of cloth that many I see in expensive retailers, nice to support small business such as all and a great venue to show your wares. 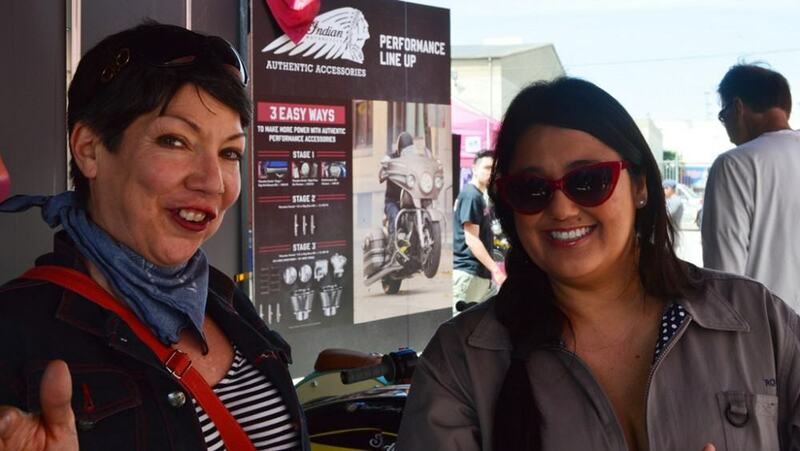 Jennifer and Gigi hanging out at the show, it was awesome to catch up with people and just have a chinwag for a while, met some great friends and look forward to next year. 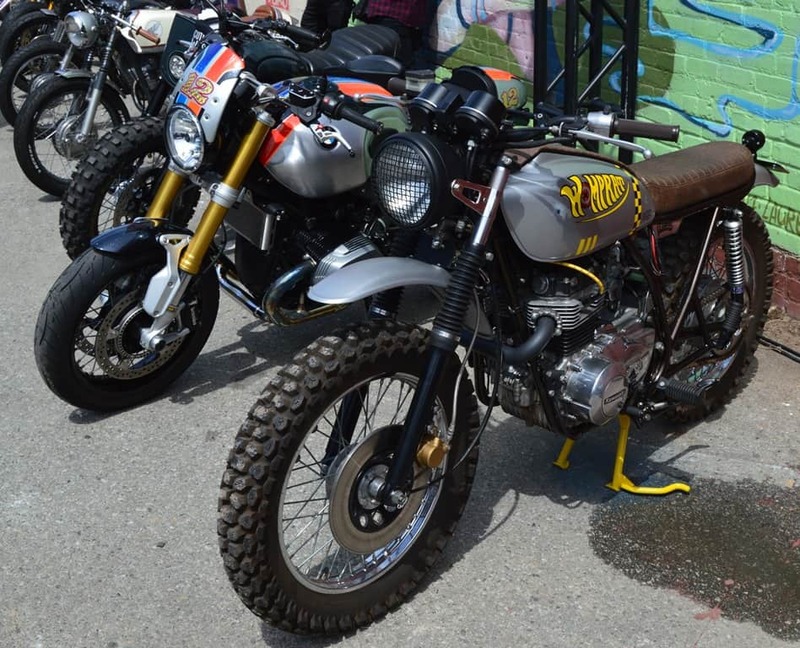 I love the Diversity of Machines that were on Display, this was inside in the art area with many other Motorcycles, I love this old Crosser, brings on memories of hurting Kidneys and arm pump when I was a kid in the UK in the 1970’s. Even something for the Jetsons fans, this Scooter was pretty darn cool and worth a tidy penny these days. 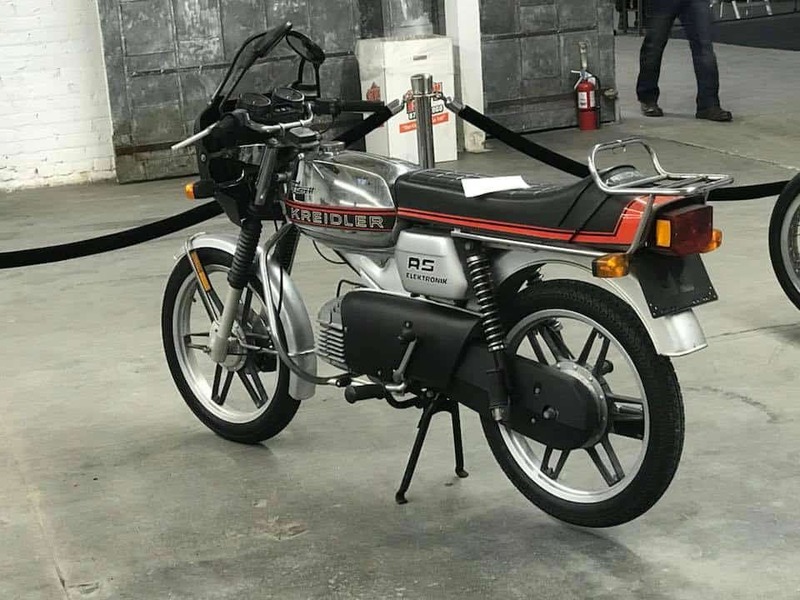 The Kriedler was a cool bike to be seen around town on when I was growing up, I had a Suzuki AP50 but these were out of my price Range, Belgium created some cool machines back then. 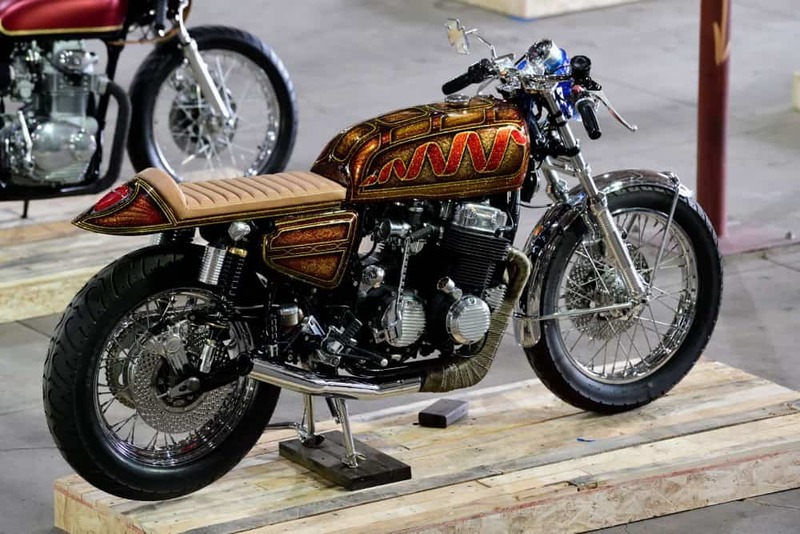 This Anvil Honda has had a lot of fabrication, I loved everything about this machine, would of liked to have chatted to the builder, well done mate. 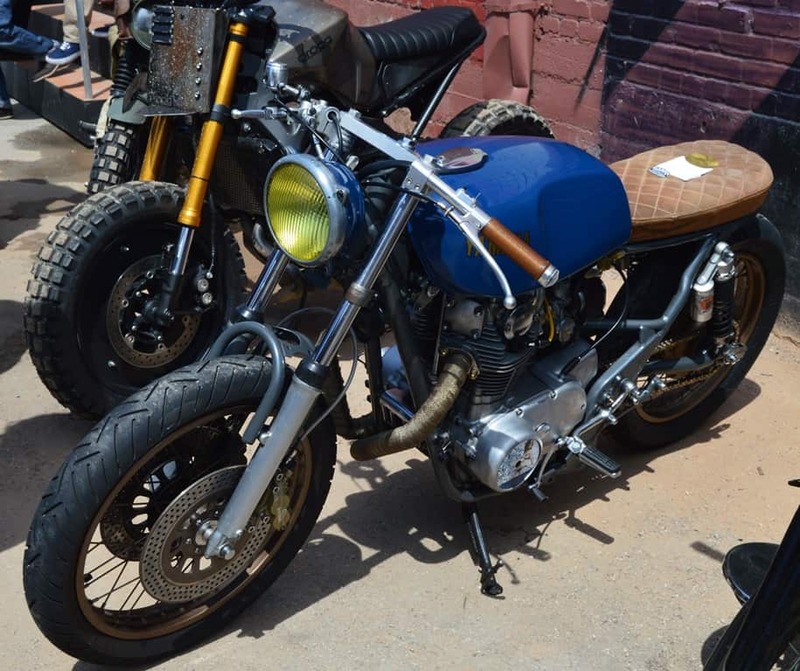 Like I said, something for everyone, steam bent wooden fairing was a neat trick on this Honda, you can see my Machine sat next to it, a great set of Motorcycles for sure. 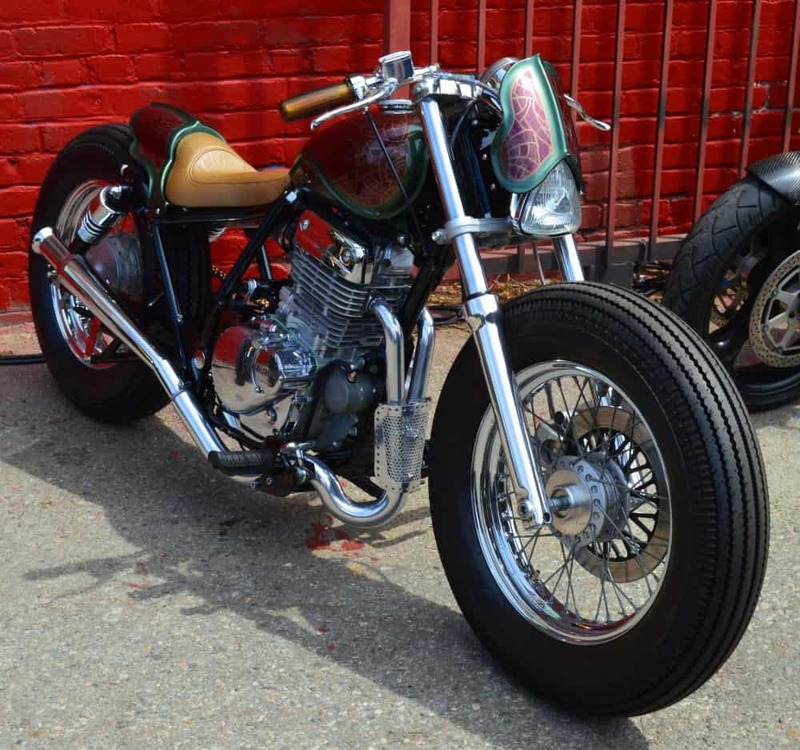 I loved this build, simplistic, albeit not much chance of seeing at night with that light but other than that a very cool and well created Bobber, Killer Paint. 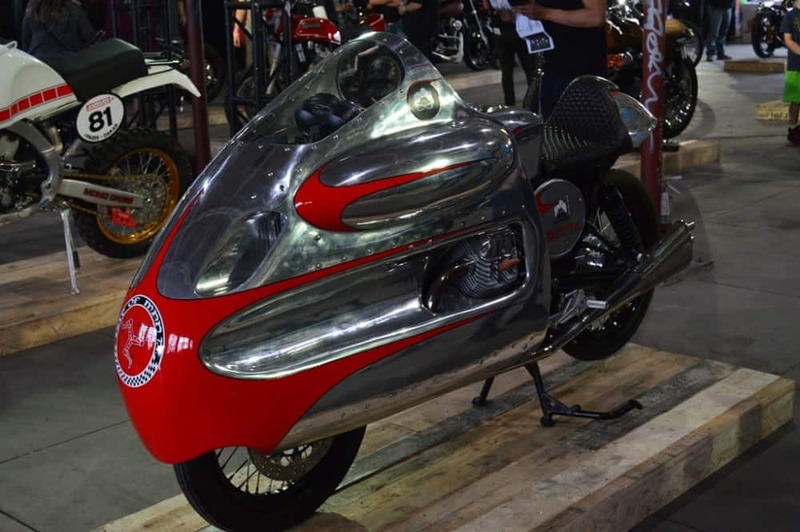 Barry Weis of Storage Wars fame had his Dustin Bin fairing machine on Display, so much work gone into this, I went back to it many times just to drool over the Aluminum. 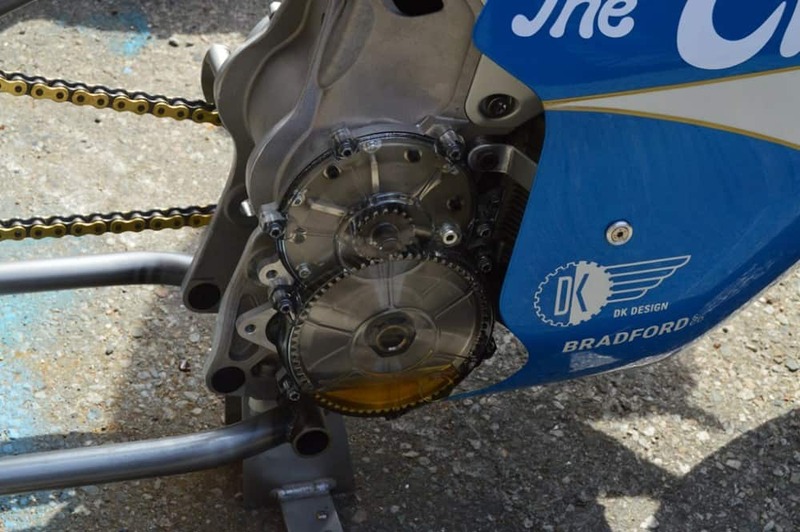 A thing of Beauty and would of loved to hear this Motor run with then pipes on, Great job Barry. 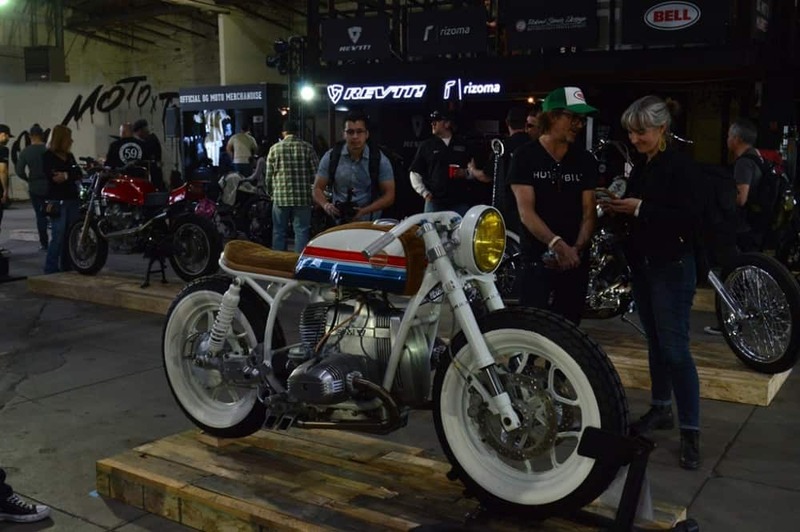 Hutch Blew me away with this Beemer, what a great build, you cant see any electrical wires and a Brave man to creat a bike in white too, this was just a masterful piece of creativity and I bow to you, this South African builder is based at Yoshi’s and is a super nice fella. 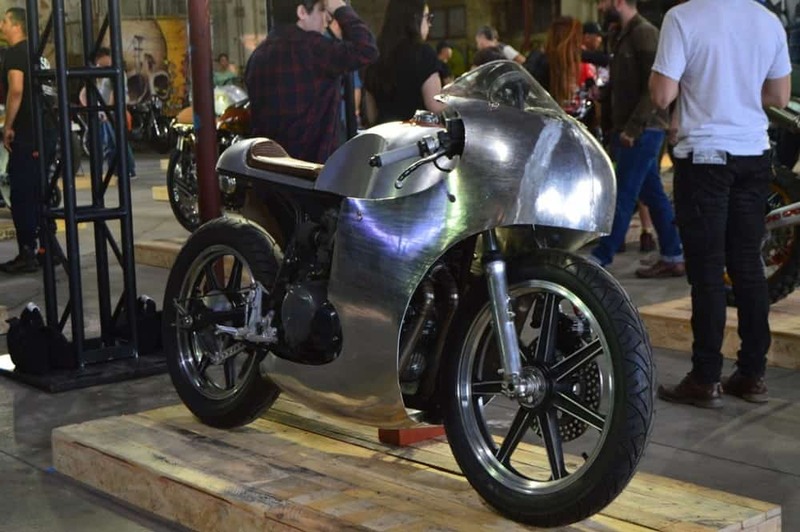 Check this out, so much Aluminum work, some very gifted people at this show and everywhere I looked I could see some fun and clever engineering. 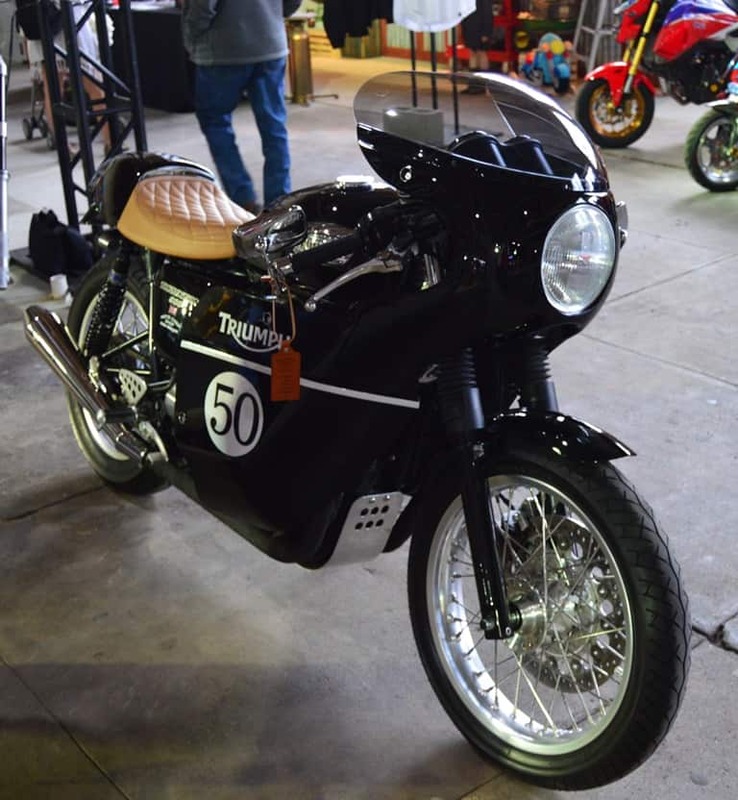 This Italian 350 Steed was tough, I would of loved to have slung my leg over it, I loved the color scheme and the rear tail Cowl, very nice piece to look at here at the show. 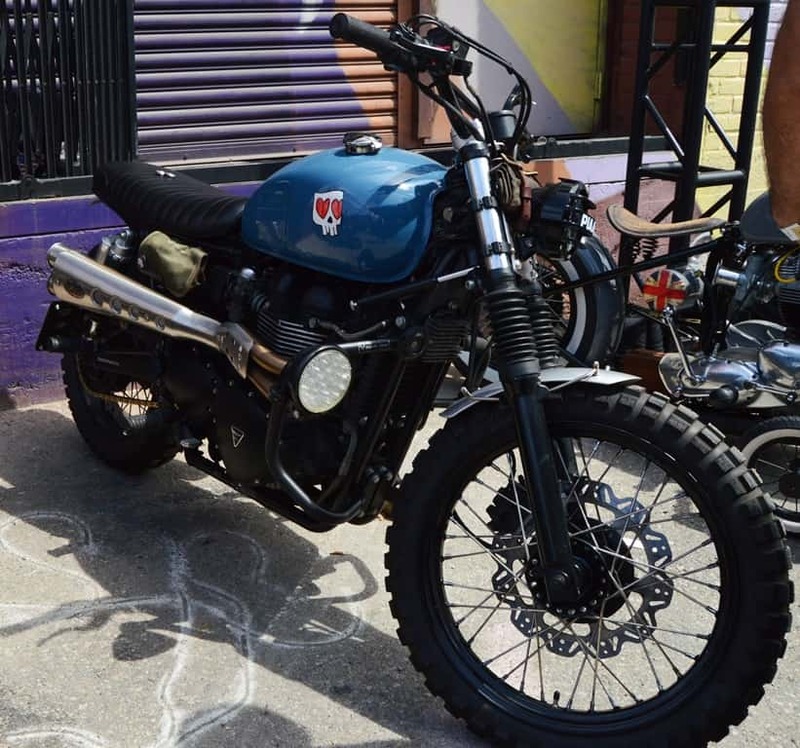 Skate Icon “Steve Caballero had this Classic Honda Tracker, Steve has a huge skill set with machines as well as art, loved looking at this, made me think of my Brother in England. Buddy of mines BMW, actually the one next to it is his wifes, very cool Toasters. Craigs super neat CB750 he created, his company is Kickstart garage up there in Redding, super nice guy who I have met a few times, and loved his Creation, Killer Color. 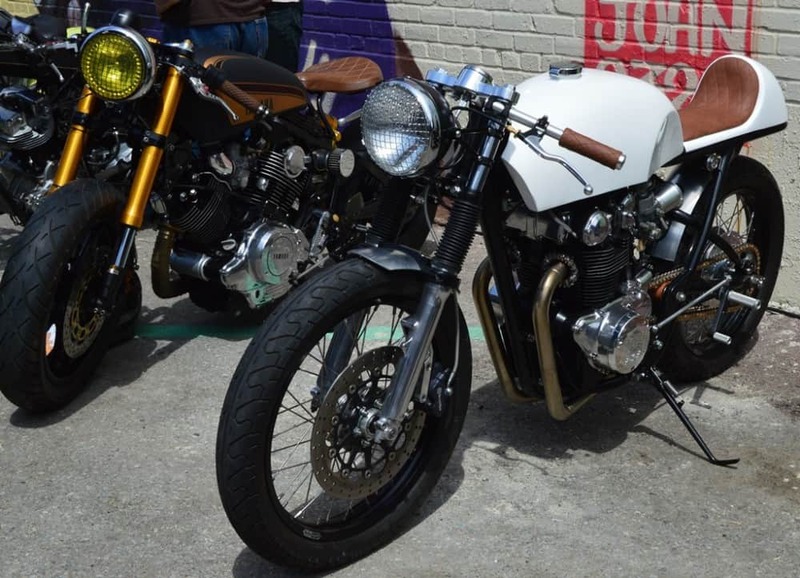 Plenty of Honda bikes here and all so different, looks like Dustin Kotts style, clean and lean, loved it. 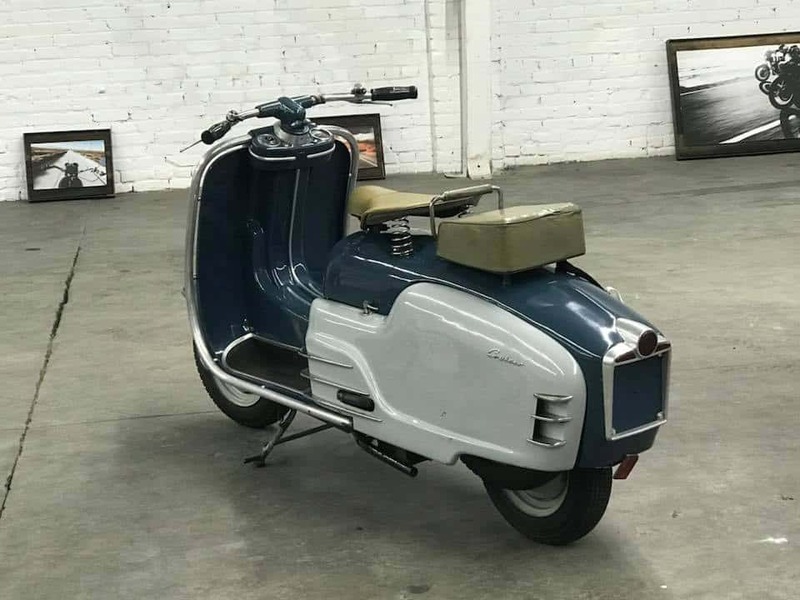 Kev from Moto Chop shops Thruxton has a full fairing now in place, fun machine with that 60’s Rockers styling, Great job mate. 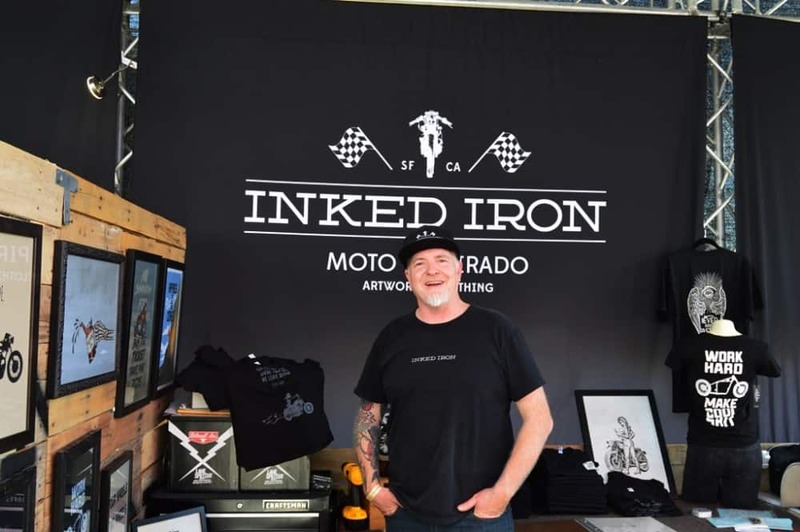 Scott and Owner Kev Stanley from Moto Chop shop, show their chops and chinwag with many, super guys and all have a passion for two wheeled machines. 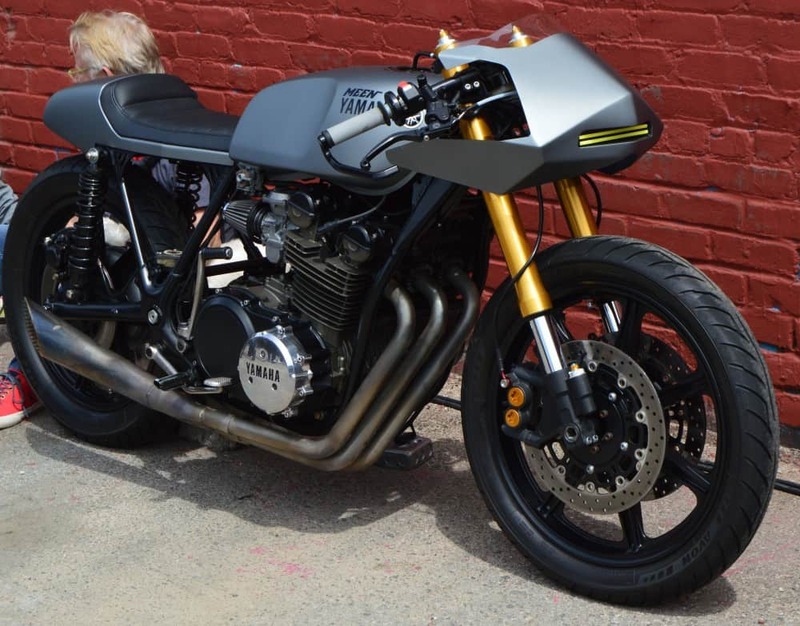 Dustin Kott has been building many years and it shows it here, clean, smooth and flowing, very nice cafe style Motorcycle and color combo. 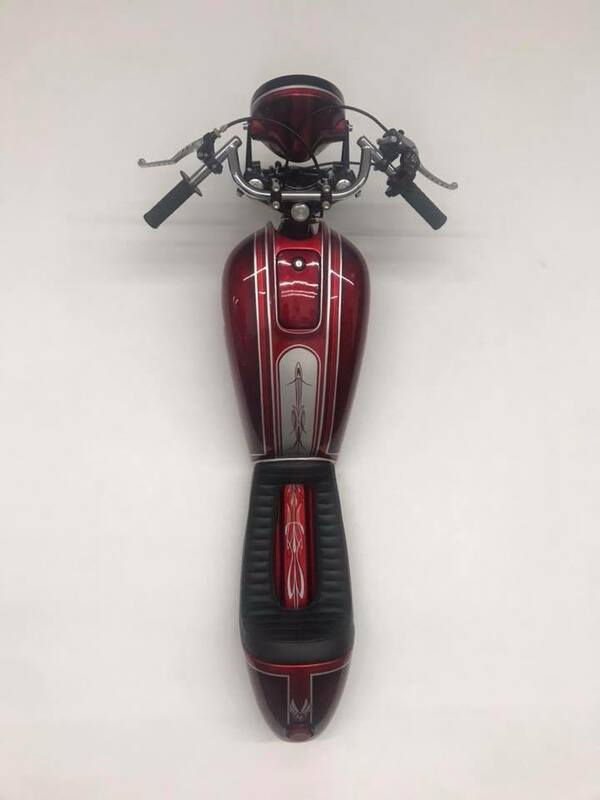 Now thats some killer alloy work, I loved this fairing, tank and seat combination, many hours with a torch and a hammer and English wheel, Loved the Lester Mags too. 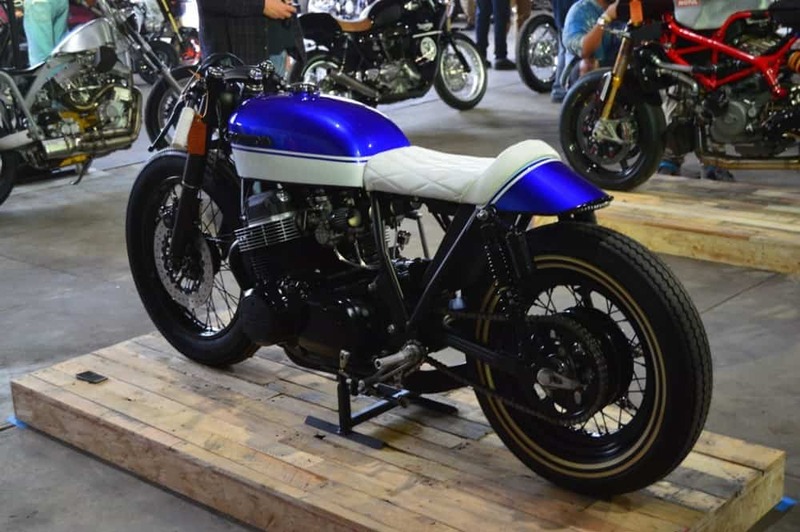 I was really into this Suzuki, a lot of cool lines, I really liked the fat attack and the stance is right on the money, fender and fairing matched well, brilliant job my friend. 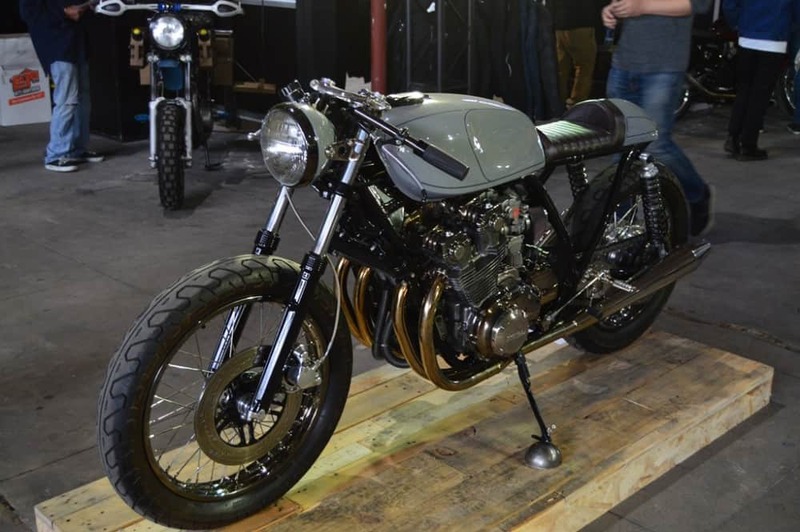 I loved the smooth lines on this what I call a Battle Star Galactica machine, this cool Yamaha was tidy and I would of loved to have ridden it, check out the stainless exhaust system. Jennifer and Mark Baker, Both in the 59 Club Orange County section, have a natter about this great show, loved the Barry Sheen shirt, I had mine on too, well, we are Both Brits remember. More 59 ers from Orange county Steve and Tiff hang out, Steve’s a Model for Stag magazine. LOL. Few more lads from the Orange County 59 ers, CJ on the right organised the ride to the show, Dennis in the middle was game too. As well as the bloke on the left and I have forgotten his name but will add as soon as my Brain gets back into gear. A slew of Machines that all caught my eye outside at the rear of the building, over 100 bikes on Display there alone and all very cool and unique to them selves. 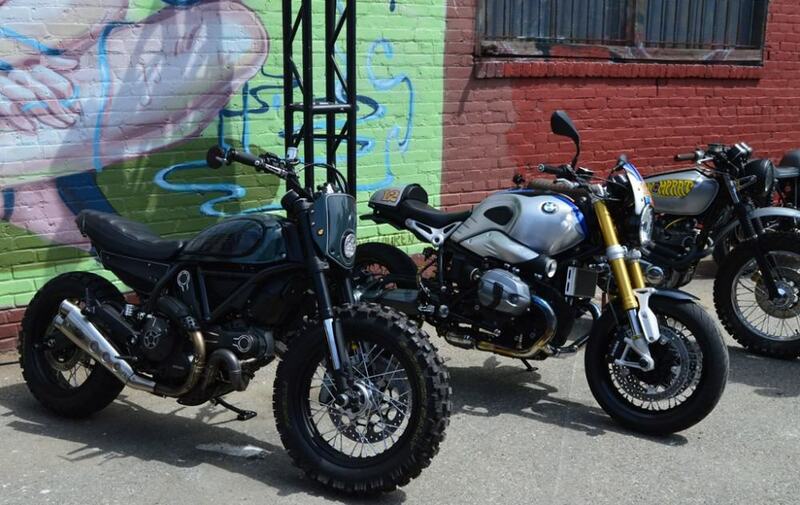 Yes, I would ride any of these, plenty for all to see and enjoy and what a relaxed and fun environment this show was. 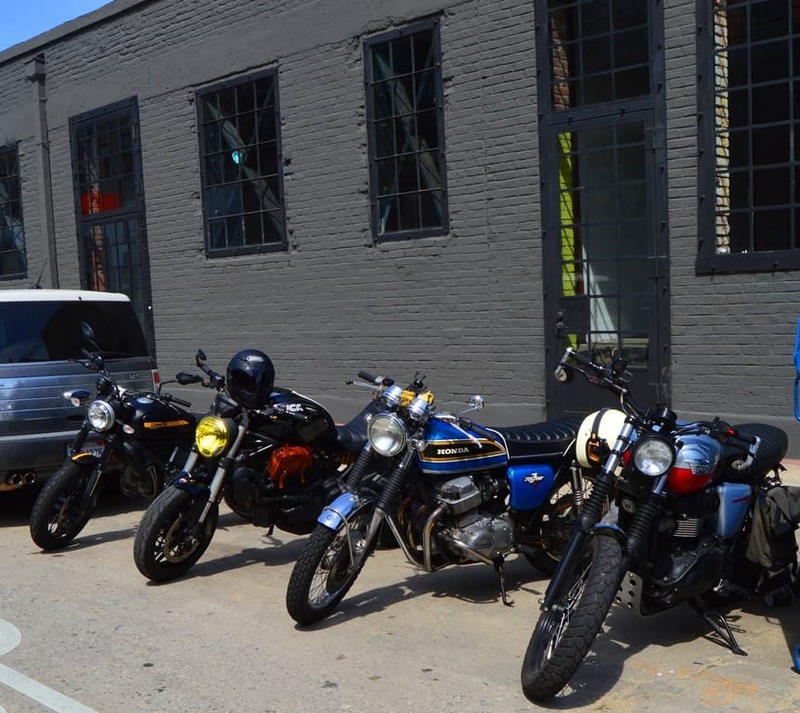 Some well put together machines here, be it Cafe Racer, Brat, Tracker, Custom etc, these were all great bikes and we really did enjoy taking all these builds in . 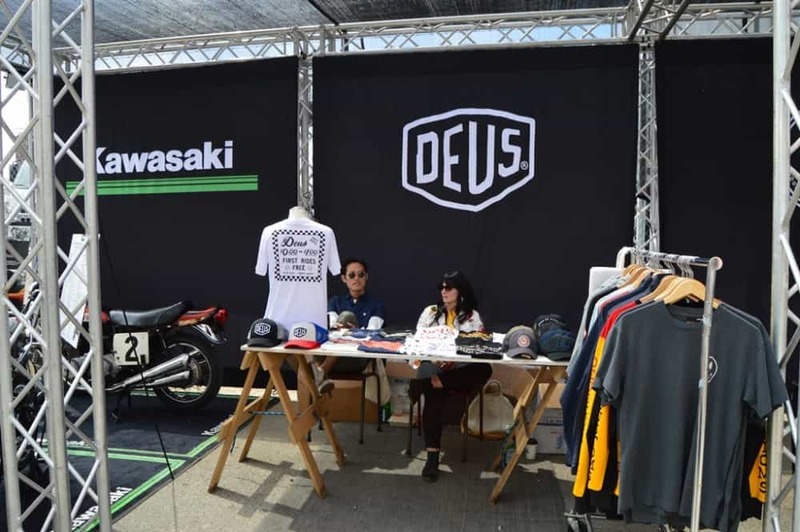 Deus doing their bit, great company of which I used to go and see in Kings Cross in Sydney when I lived there in 1997. 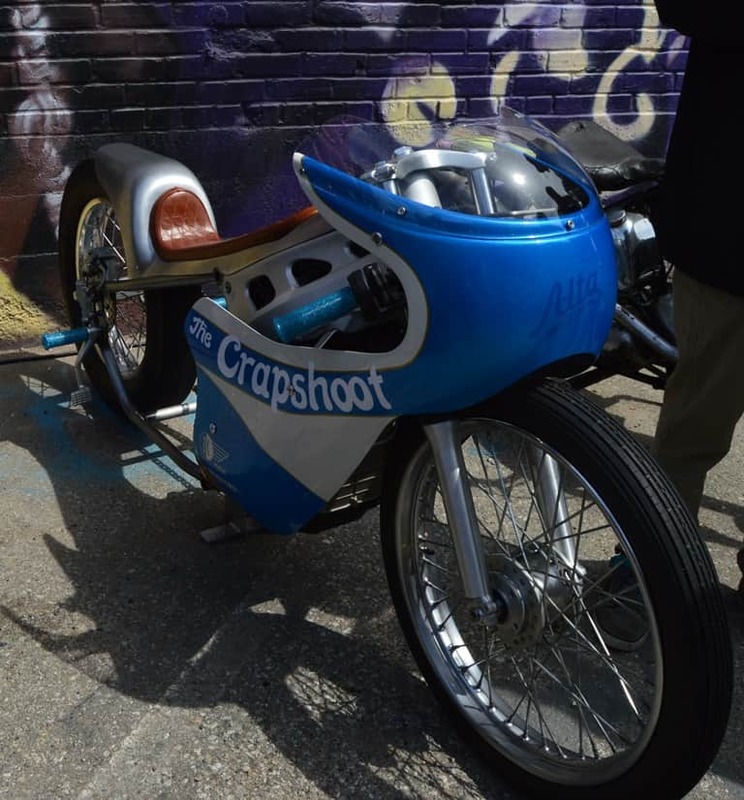 How could you not love this Drag bike, its a crapshoot alright, awesome stuff. 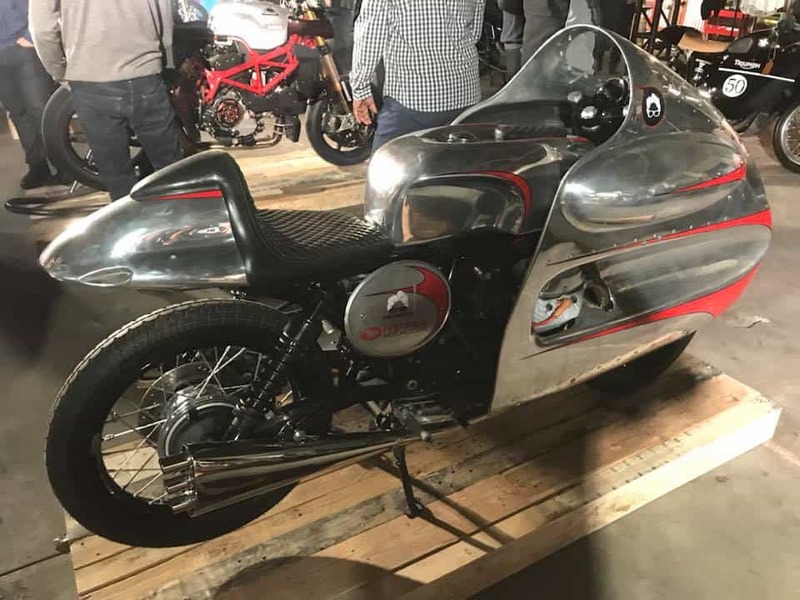 Above: How about that, Plexi covers, I loved this Motorcycle and it should of been up on a stand so people could see all the engineering involved on this Rocket! 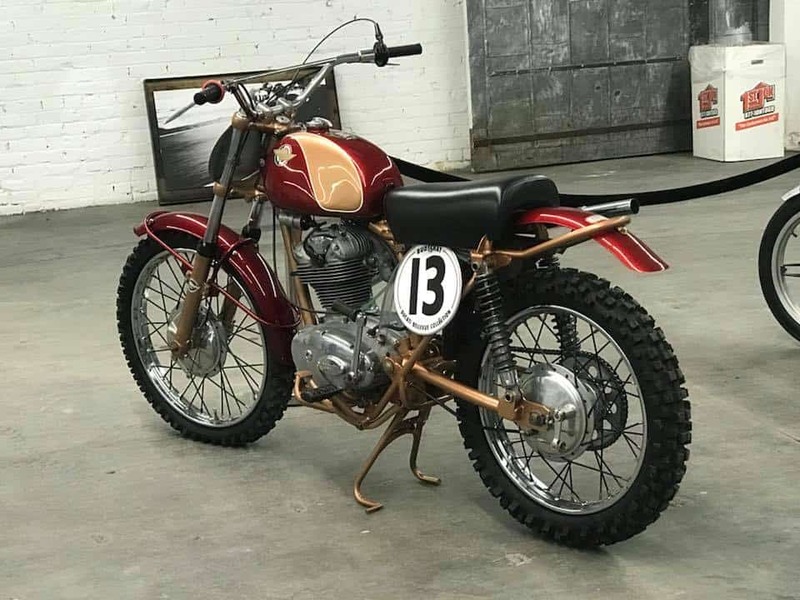 I have always dug Scramblers, even as a kid, so to see new versions cropping up here and there is always a treat for me, all of them are individual and this is a cool ride. 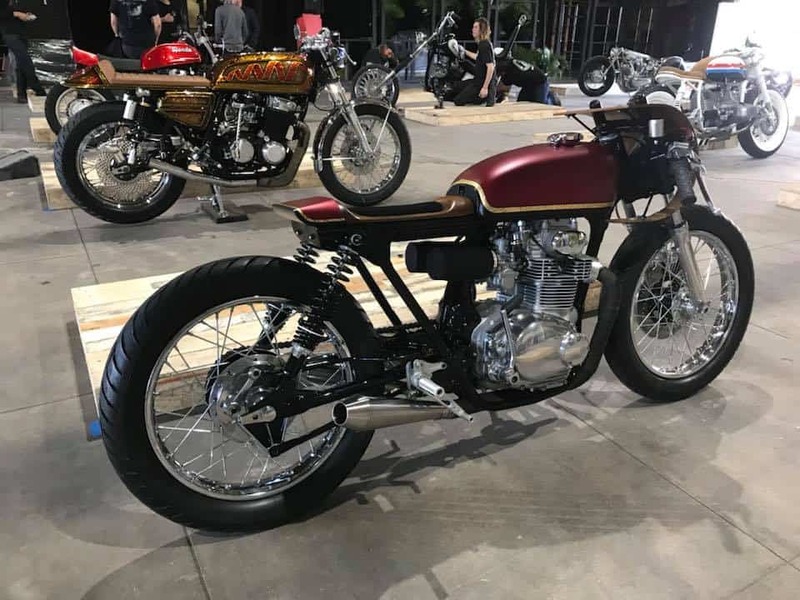 Another Tough Yamaha and has the right look and stance, and that fork brace will make sure there is no wobble at the front end, great achievement mate. 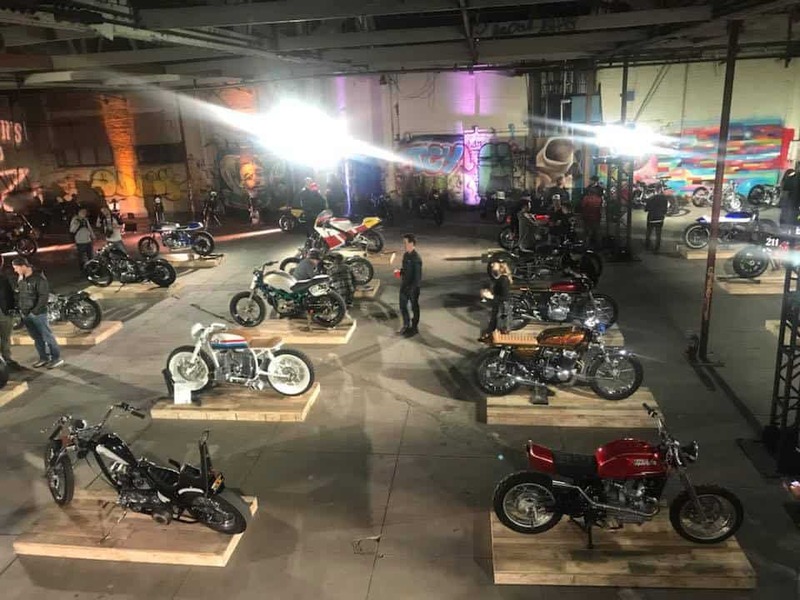 Everyone that looked at the Motorcycles and art that was on display at this unique event, all seemed to be happy, thats a great thing to see and I sure hope that we have many more shows in this guise. 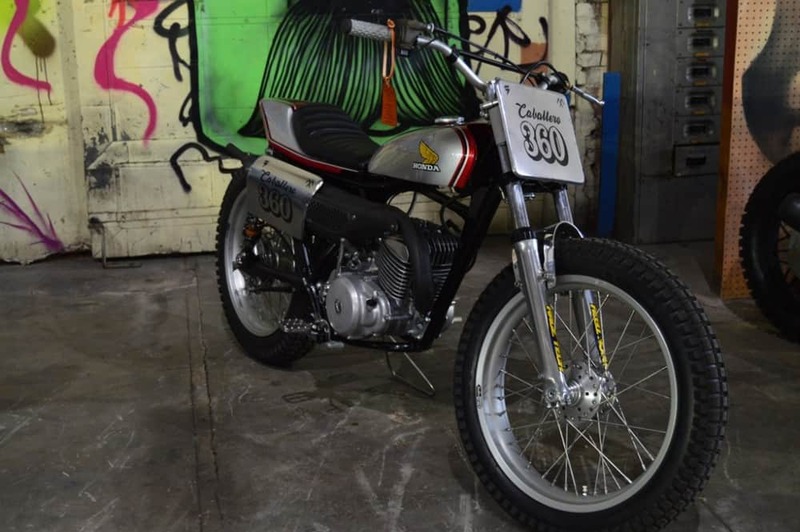 I loved this Bultaco, not sure if Originally it was a Sherpa T or a Persang, but I loved this transformation , could be an original TSS motor too, but I loved the sound of these Spanish 2 strokes and what a machine, so clean lines, well done mate. 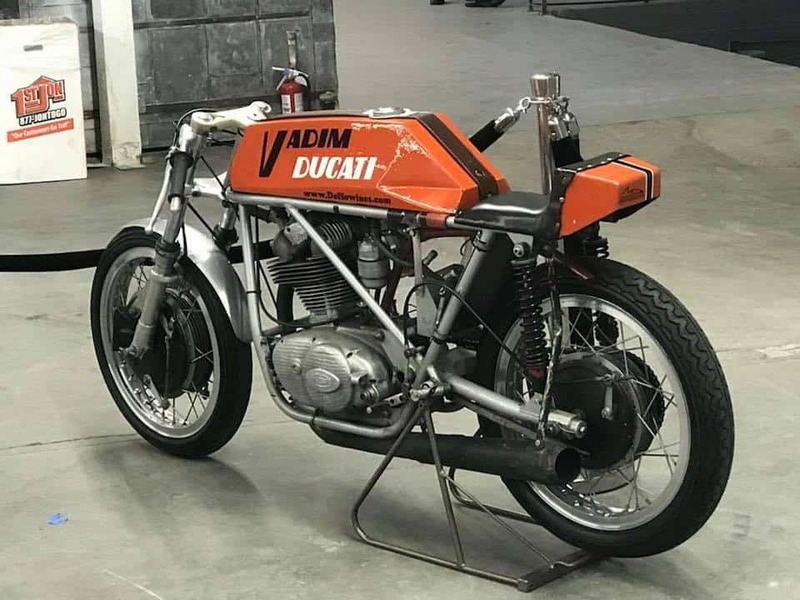 It is always refreshing to see two wheeled machines taken to another level, this has had a lot of work to get how it is today and I spent a little time looking at the complexity of this particular build, kudos to you for your time and patience. 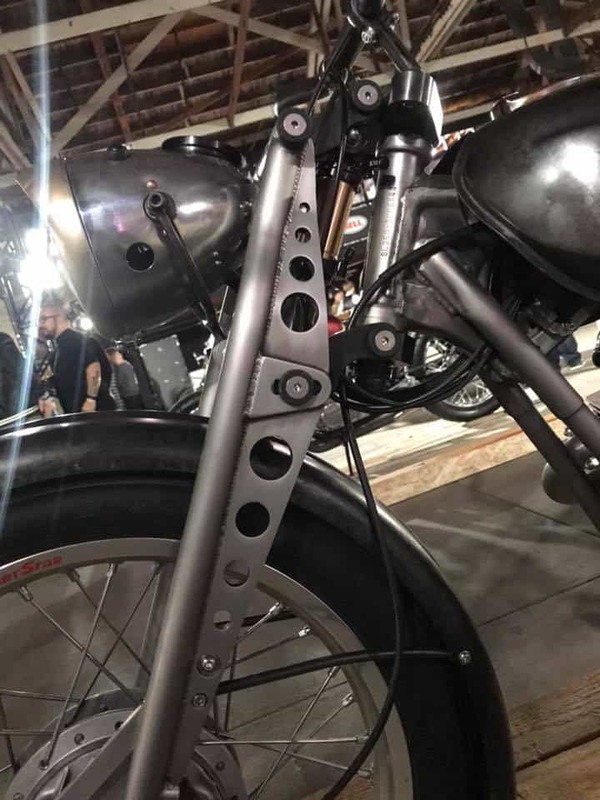 I liked everything about this Tracker, smooth flowing lines and loved the headlight shield, I would ride that bike all the time and so nice to see it at the OG show here in LA. 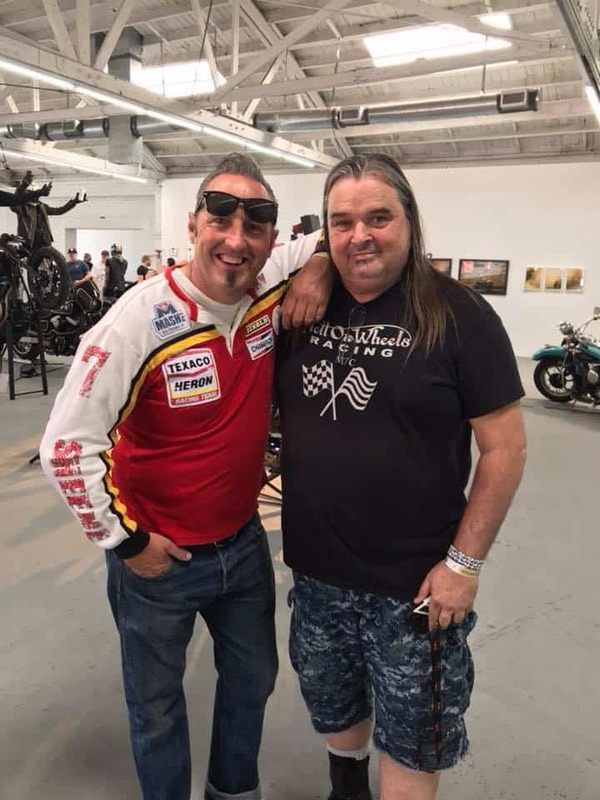 A very good mate of mine Mel Bain, Actor, School teacher and Motorcycle aficionado, super cool to meet up and see him and his lovely wife at the show, he enjoyed the outlier guild show immensely. 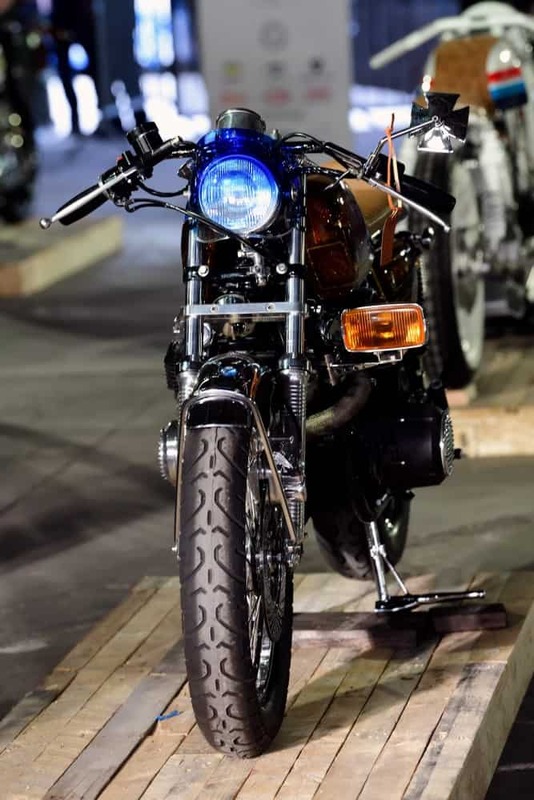 Bikes outside and all over the place in Down Town LA and was great to see some of them parked up for the show. The weather was super nice as well, which meant for enjoyable riding for everybody that visited the show here, we walked about quite a lot before heading back, there were bands playing that we wanted to see. Looking forward to the show next year, well done Jay Larossa for getting this together. Hope some of you managed to see some of the bands playing, they were great and the whole event had a great vibe all the time. 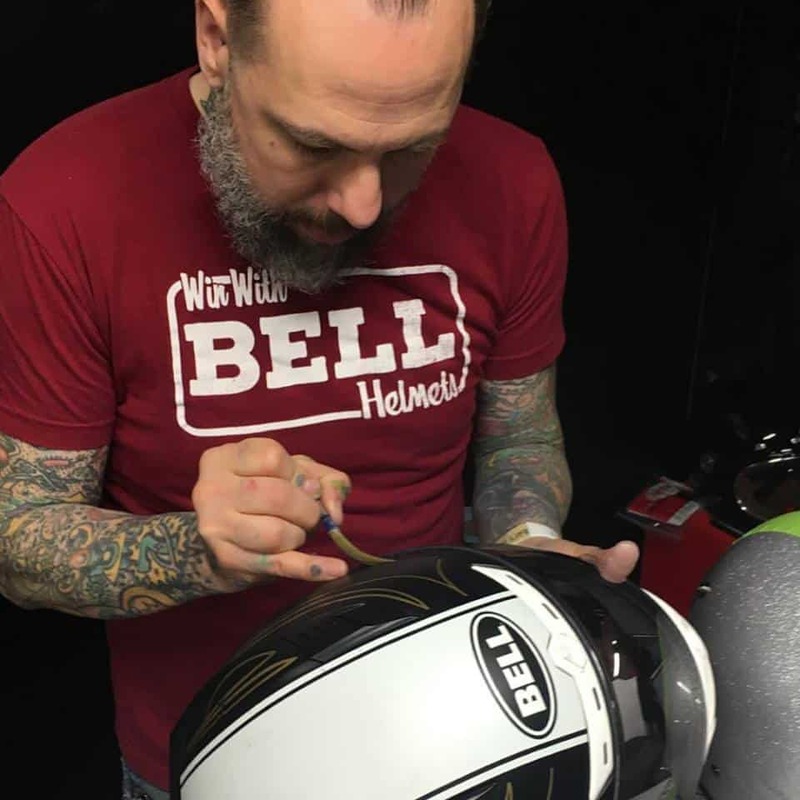 He has been laying Pin lines for many moon’s, as well as lettering etc, he does a lot for Bell helmets too, a very cool Hot Rod and Kustom builder too, a super all around talented guy that I have had the pleasure of being mates with. Skratch, doing what he loves and he can lay down pin lines with speed if needed, a very talented and approachable geezer. 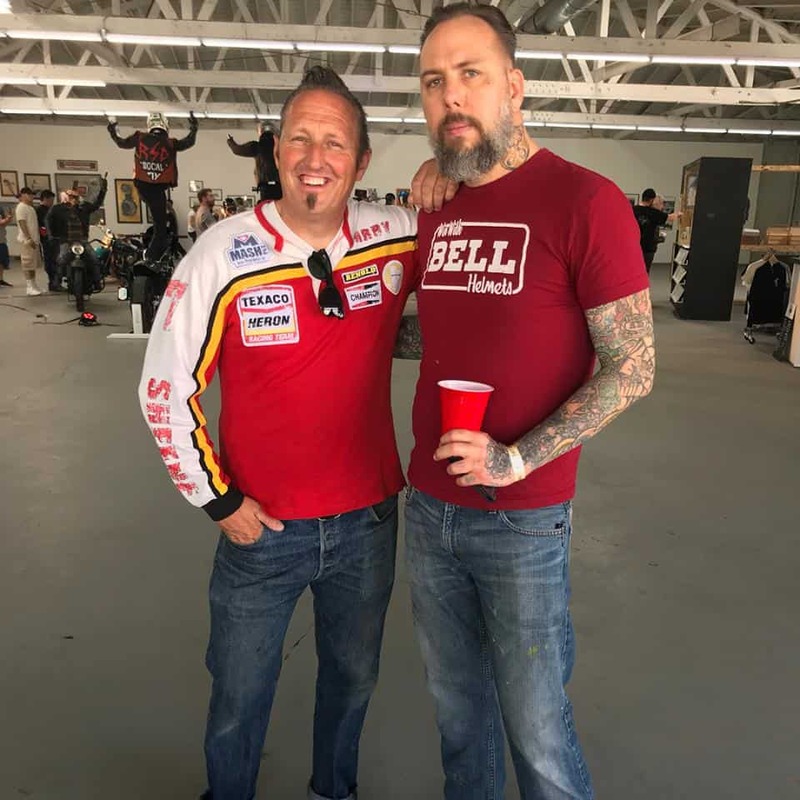 So, with that, I shall bid you all a find farewell, this was a brilliant show, thanks again to @jaylarossa for putting together LA’s coolest Custom Motorcycle show, bringing us all together as a cohesive lifestyle of 2 wheeled aficionados. Until the next time, many thanks for reading my Blog, it took a while to download and get this on my website but hope you found something interesting. Promote small businesses in the Custom world, we all need you. 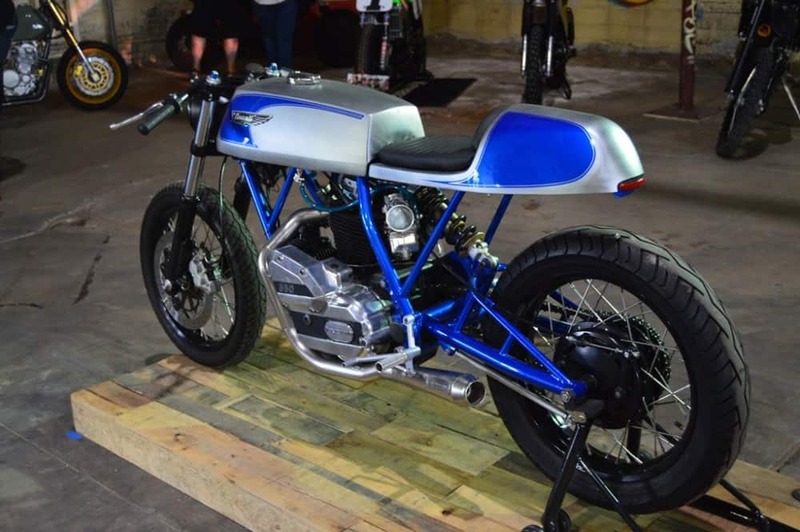 If this inspires you to get in your Garage or shed and create, then I have achieved another smile in the 2 wheel industry, thanks once more for reading. 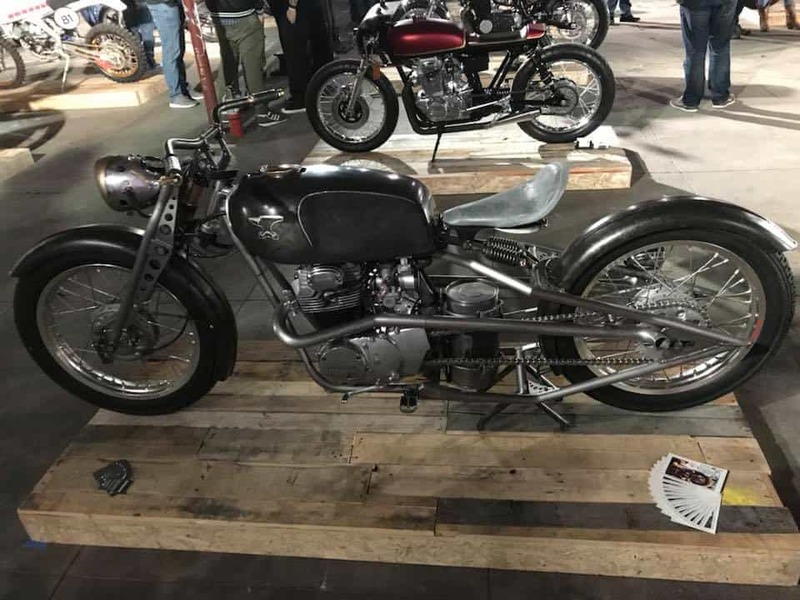 This entry was posted in Blog and tagged bmw, bobber, brat, Builders unite, Bultaco, cafe racer, cb350, cb550, cb750, chopper, CL175, custom, Custom Build, Downtown LA, drag, harley, Honda, LA show, Motorcycle builders, motorcycle show, Motorcycle shows, OG Moto, outliers Guild, scrambler, suzuki, tracker, triumph, yamaha.